In the age of Square payments and online food delivery apps, it’s easier than ever to click a button and tip your barista or delivery guy. But those aren’t the only people you should give a little extra. 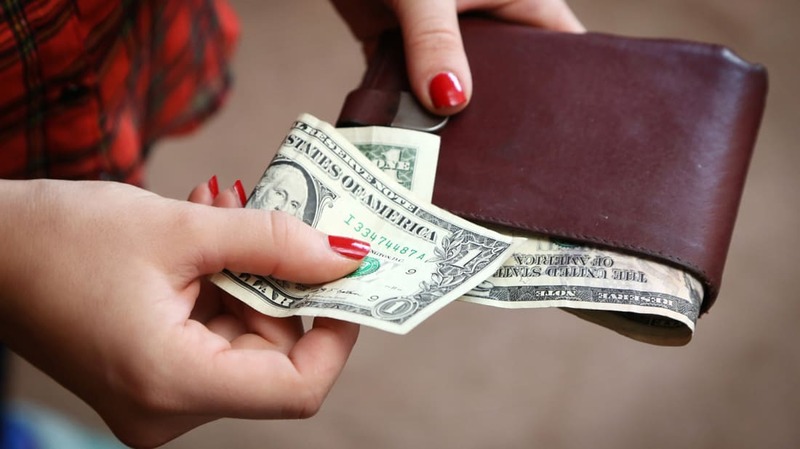 Here are a few tips for tipping, lest you start being known around town as a total Scrooge. Tipping 15 percent of the pre-tax bill (20 percent for good service) at restaurants is standard, but depending on where you live, a larger tip might be in order. In some states, tipped workers make less than minimum wage—even in expensive regions like Washington D.C.—so it’s always better to tip on the generous side. The federal tipped minimum wage is a horrifying $2.13 per hour, so keep that in mind before you stiff someone. Plus, you should keep in mind that tips often don’t go solely to your waiter or waitress—tips are pooled between wait staff and back-of-the-house workers, and usually there are restaurant rules governing who wait staff should be tipping out. Bartenders, bussers, and runners usually get a cut, since they also play a big role in making sure your food and drink gets to the table in a timely manner. At least a dollar per drink is the minimum, but if you’re on a tab, you can do the usual 15 to 20 percent. If you’re taking up bar space for hours but not drinking much, or if your bartender comps you a free drink, throw them a little extra. The same goes for complicated cocktails. The Emily Post Institute’s official policy is that there’s no obligation to put a dollar in the tip jar, but if you’re a regular or you’re asking for a complicated order, please be generous. While baristas generally make minimum wage, chances are they’re not getting paid much more than that. The Washington Post reports that at one D.C. coffee shop, tips account for around an extra $3 per hour for workers, while at a local La Colombe, baristas get about $50 a day from tips. When you’re slinging lattes to pay your bills in an expensive city, that kind of extra money can make a big difference. According to the food experts at Eater, the minimum tip for any delivery order, no matter how small, should be $5. On a larger order, go with 15 to 20 percent standard. That means if a 15 percent tip is less than $5, don’t default to the cheaper option! The same goes if you get groceries delivered. Remember, drivers don’t get a penny of that delivery fee, so don’t be stingy. And if you’re not sure why you need to pay a little extra for the pleasure of eating restaurant food in your pajamas, Groupon’s interview with a former pizza delivery driver is worth a glance. If a valet brings your car around for you, you should fork over at least $2 before driving away. That driver is the one keeping your nice car from getting dinged. Yes, you should give someone a buck for handing you paper towels and providing some lotion. But if the attendant is just there to make sure no funny business goes on in the restrooms, the Etiquette Scholar says you don’t need to tip. A good rule of thumb is, if someone’s touching your body, tip generously. For one thing, that person has to deal with your gross toenails or back pimples. Give at least 15 to 20 percent to your manicurist, massage therapist, and waxing specialist. Keep in mind that in some salons with especially cheap services, your manicurist could be working for illegally low wages. And in the case of massages, working out those muscle knots for 60 to 90 minutes is hard, physical work. Tip accordingly. You need to tip the hotel staff, and the American Hotel and Lodging Association has a helpful tip guide you can consult [PDF] to figure out who gets how much. Tip a dollar or two to your shuttle driver, the bellhops who carry your luggage, and the door staff that hail your taxis. Housekeepers should get between $1 and $5 per night, left daily with a note specifying that it’s for them. Tip a dollar if the staff has to bring you something extra, like a cot or an extra blanket, and tip your concierge $5 to $10 depending on whether you’re getting restaurant recommendations or a hard-to-get theater ticket. In addition to the 15 to 20 percent tip, you should give your driver at least $2 for any bags carried. Maybe more if your suitcase is as heavy as a small whale.